The term "world-class manufacturer" is popularly used to denote a standard of excellence: the best of the best manufacturers at the international level. It came into prominence following the 1986 publication of World Class Manufacturing: The Lessons of Simplicity Applied by Richard J. Schonberger, which was his follow-up to Japanese Management Techniques: Nine Hidden Lessons in Simplicity. World marketplace events during the 1970s and 1980s caused competition to grow to such an intense level that many firms were forced to re-examine their concept of manufacturing strategy, especially in terms of the tradeoffs among the four competitive priorities: cost, quality, delivery/service, and flexibility. Managers began to realize that they no longer had to make these tradeoffs but could instead compete on several competencies. Some of those excited by the concept describe it as capturing the breadth and the essence of the fundamental changes taking place in larger industrial enterprises, with their overriding goal and underlying mindset of continual and rapid improvement. Others describe it as the culmination of the relentless pursuit of competitive excellence. Richard Schonberger states that the emphasis on world-class manufacturing may someday be chronicled as the third major event in the history of manufacturing management, following the use of standard methods and times espoused by Frederick Taylor and Frank Gilbreth, and the findings of the Hawthorne experiments at Western Electric, which held that motivation, to a significant degree, comes from recognition. For simplicity's sake, we will describe a world-class manufacturer as a company that is able to compete effectively in a global market. Clearly, there are some demands placed on individuals and organizations that desire world-class status. Peter Stonebreaker and Keong Leong presented a hierarchy of steps, appearing as five levels, that lead to world-class operations (see Figure 1). This series of steps will be used to describe the characteristics of world-class manufacturers. Source: Stonebreaker, Peter W. and Leong, G. Keong, Operations Strategy: Focusing Competitive Excellence. Boston: Allyn and Bacon, 1994, pg. 578. All world-class manufacturers have an explicit, formal manufacturing mission. Within this mission is the operating goal to become world class. They use competitive information to establish organizational goals and objectives, which they communicate to all members of the enterprise. They regularly assess the appropriateness of these objectives to attaining and maintaining world-class status. World-class manufacturing requires an overall willingness to establish closer connections with everyone, from suppliers to workers. It requires an unwavering commitment to self-analysis and improvement. It requires an aggressive approach to technology that can turn visionary strategies into reality. All of these must be reflected in the firm's business and operations strategy if world-class status is to be attained. The following sections discuss how organization design, human resources, technology, and performance measurement factor into an organization's effort to become a world-class manufacturer. World-class manufacturers integrate all elements of the manufacturing system in such a way that the needs and wants of its customers are satisfied in an effective, timely manner. This requires the commitment and the expenditure of efforts and resources by all elements within the system to ensure their proper integration. This commitment extends to outside elements as well, as the world-class manufacturer encourages and motivates its suppliers and vendors to become co-equals with the other elements of the manufacturing system. World-class manufacturers work to eliminate organizational barriers to communication and to organize the firm in such a way that the core values needed to reach world-class status take precedence. In fact, most companies that have succeeded in implementing many of the world-class tools—such as just-in-time production (JIT), total quality management (TQM), manufacturing resource planning (MRP II) and total productive maintenance (TPM)—already had the core values well in place. Companies that are already world class are able to quickly absorb other world-class manufacturing concepts as they are developed and publicized. World-class manufacturers recognize that employee involvement and empowerment are critical to achieving continuous improvement in all elements of the manufacturing system. The continuity of organizational development and renewal comes primarily through the involvement of the employee. World-class companies invest comparatively more in their relationships with their workers, providing significantly more training than their competitors. An Industry Week survey found that firms approaching world-class status were three to five times more likely to report "highly effective" human-resources programs than other firms. Some analysts note that combining lean manufacturing principles with employee participation can help firms become world-class manufacturers. A great deal of emphasis is placed on technology, equipment, and processes by those trying to attain world-class status. World-class manufacturers view technology as a strategic tool for achieving and maintaining their world-class status. A high priority is placed on the discovery, development, and timely implementation of the most relevant technology available and the identification and support of those who can communicate and implement this technology. The most highly competitive firms have made significantly more progress than others in implementing TQM, reengineering, simultaneous engineering, group technology, computer-assisted manufacturing (CAM), material resources planning (MRP), and the use of local area networks (LANs). World-class manufacturers recognize the importance of measurement in defining the goals and performance expectations for their organization. They routinely adopt or develop the appropriate performance measurements needed to interpret and quantitatively describe the criteria used to measure the effectiveness of their manufacturing system and its interrelated components. Use of the proper measurements allows world-class manufacturers to assess their performance against themselves (internal benchmarking), their competitors (competitive benchmarking), and against other world-class manufacturing firms that are not competitors (generic and functional benchmarking). World-class status is achieved through a relentless commitment to continuous improvement, which cannot be achieved without measurement. 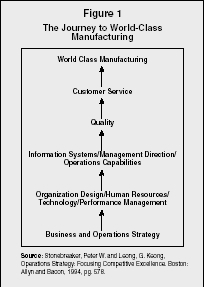 The following sections discuss how information systems, management direction, and operations capabilities factor into an organization's effort to become a world-class manufacturer. World-class manufacturers require world-class information systems for collecting, processing, and disseminating data and for providing the feedback mechanism that is necessary for meeting their objectives. Information systems are fully integrated into the business processes of firms that adhere to continuous improvement and TQM strategies. Capturing and analyzing customer feedback and designing, manufacturing, and delivering world-class quality products and services is rooted in superior information systems. Richard Schonberger states that functions within a world-class firm all have a common language and signaling system. World-class firms embrace computerized maintenance management and computer-integrated manufacturing. Additionally, organizational commitment to continuous improvement is supported by the strategic use of information systems. Management is responsible for directing the manufacturing organization's journey to world-class status and for creating an organizational culture committed to all that is necessary for achieving continuous improvement. Corporate culture and values are the foundation for superior manufacturing, which in turn reflects and is reflected by the caliber of corporate management. This implies that personal commitment, involvement, and a sense of direction by management are critical to the success of world-class firms. The manufacturing excellence needed for world-class status is nurtured by direction from superior management, which must penetrate the manufacturing function, viewing and managing it as an integral, indivisible part of the firm. It cannot tolerate mediocrity or even average manufacturing performance. Management must seek to describe and understand the interdependency of the multiple elements of their manufacturing system, to discover new relationships, to explore the consequences of alternative decisions, and communicate unambiguously within the organization and with the firm's customers and suppliers. Stimulating and accommodating continuous change forces management to experiment and assess outcomes. They must be able to translate knowledge acquired in this way into some sort of direction, framework, or model that leads to improved operational decision making, while incorporating a learning process into their fundamental operating philosophy. The objective of world-class status tests management's ability to learn, adapt, and innovate faster in the face of an intensely competitive global market. World-class manufacturers are concerned with whether their operations systems have the ability to meet design specifications, rather than with evaluating the quality and quantity of products after the fact. In order to attain world-class status, the manufacturing firm has to be given the proper resources. With these resources, the firm must have the capability to produce the right quantity, the right quality, at the right time (often just in time), and at the right price. The proper technology must be on hand or readily attainable. In addition, the firm must have the necessary managerial capabilities to compete successfully on a global basis. For many firms, the necessary operational capability involves the ability to provide customers with a large degree of flexibility of either product or volume, or exceptional response time to orders, changes in orders, or new product development. Beyond the firm itself, operations capability implies a superior interactive relationship with all vendors and suppliers. World-class firms have extensively implemented JIT, are heavily involved with programs that contractually commit suppliers to annual cost cuts, and are making efforts to involve the supplier early in the new product development process. World-class manufacturers place an emphasis on quality. Firms in this category are usually in an advanced state of TQM implementation, continually seeking to enhance their business. All quality costs (prevention costs, appraisal costs, and cost of defects—both internal and external) are evaluated and held to the lowest reasonable sum. "Zero defects" is the goal of the world-class manufacturer. In order to achieve zero defects, the world-class firm is educated in and has fully implemented statistical quality control (SQC), sometimes called statistical process control (SPC) or quality at the source. Hence, quality is maintained and elevated through quality planning, quality control, and quality improvement. In conjunction with this effort to improve processes and products, world-class firms utilize an activity called benchmarking. This involves comparing the firm's performance, either overall or in a functional area, with that of other world-class organizations. The use of TQM techniques, according to some analysts, is the most striking differentiator between world-class and non-world-class firms. Quality has also been found to be the most important competitive differentiator in the eyes of the customer. World-class manufacturers instill within their organization and constantly reinforce the idea that all who are a part of the organization must know their customers and must seek to satisfy the wants and needs of not only the customers, but also all other stakeholders. The goal of satisfaction is pursued in regards to the product, order processing, delivery, quick response to changes, and service after the sale. After all, the goal of continuous improvement is to improve processes and add value to products and services in such a way as to increase customer satisfaction and loyalty and ensure long-term profitability. While world-class manufacturing may be difficult for manufacturers to define, many say they know it when they see it. Whatever it is, it must be from the customer's vantage point. An Industry Week survey found that, among factories approaching world-class status, a higher percentage were likely to belong to public companies; have corporate parents with revenues greater than $1 billion; participate in an automotive industry value chain; and employ 250 or more people at the location. These firms reported large cost reductions over the previous three years, as well as increased revenues, higher capacity utilization, higher sales per employee, and returns on invested capital (ROIC) that exceeded that of other manufacturers. Daniel F. Baldwin states that truly world-class firms are always examining their business processes and continuously seeking solutions to improve in key areas, such as lead time reduction, cost cutting, exceeding customer expectations, streamlining processes, shortening time to market for new products, and managing the global operation. World-class manufacturers are the ones that possess the knowledge and technology to provide products and services of continually improving quality. It is what separates practitioners of the new paradigm from the industrialist dinosaurs. Baldwin, Daniel F. "Q&A: World-Class Manufacturing." Surface Mount Technology 18, no. 1 (2004): 23. ——. "The Right Stuff, Revisited." MSI 21, no. 9 (2003): 26–30. ——. World Class Manufacturing: The Lessons of Simplicity Applied. New York: The Free Press, 1986. Stonebreaker, Peter W., and G. Keong Leong. Operations Strategy: Focusing Competitive Excellence. Boston: Allyn and Bacon, 1994. Taninecz, George. "Long-Term Commitments: Practices and Performances Validate World-Class Plants." Industry Week 253, no. 2 (2004): 51–53.